. : Optics & Photonics Focus :: The Ultimate Resolution :. Even the best microscopes in the world are not powerful enough to see the details of single molecules. Now, researchers have found a way to image these details, paving the way to a better understanding of molecular physics, and taking another step towards designer molecules. Inside a fluorescent molecule. The molecule shown in the picture belongs to the group of porphyrins; heme, the red pigment in blood cells, also belongs to the same group. Ho and collaborators have demonstrated that they are able to zoom in on a single molecule and create a map of its fluorescence, with a resolution never achieved before, thus showing, in quite fine detail, how the molecule works inside. You are in Paris with your buddies, and, like any self-respecting tourist, you make up your mind to visit the Eiffel Tower… this, despite your crippling fear of heights! All it takes, however, is one look all the way up for this fear to kick in, and you reluctantly agree to play ground photographer instead. You take a photo with your phone, and you realize that it has come out blurry: not only can you not see your friends clearly, but you cannot even tell which one is who! Resolution is a problem that photographers and researchers who study single molecules — the smallest collections of atoms found in nature— share. Now, Wilson Ho and coworkers at UC Irvine, in California (USA), have demonstrated that they are able to zoom in on a single molecule, showing, in quite fine detail, how the molecule works inside. Many molecules act like tiny machines, consuming energy to do useful work. For example, ion channels in our cell membrane act like house gates, letting in some atoms but not others. Motor proteins literally walk along muscle strands, carrying energy where it is needed. Scientists would like to add to nature’s collection of blueprints in order to help fight disease, or to build better power sources. With this goal in mind it is crucial to gain information about fluorescence, as this can tell us how a molecule is affected by its environment. Fluorescence is what makes laundry detergent, psychedelic posters and most paper money glow under a UV light. It is a process in which light of a certain wavelength is absorbed by a molecule, and then emitted as a different color at a shorter wavelength. Any time a molecule becomes stuck to a surface, or any time it interacts with other molecules, its fluorescence changes. Until now, resolution stood in the way of gaining information about fluorescence from a single molecule. For many years, the traditional approach was to collect a large number of molecules in a solution and measure their properties as an average, which is like looking at a school of red and blue fish, and concluding that all the fish are, in fact, purple: crucial differences can get lost in the averaging process. Fortunately, for almost two decades now, we have been able to see fluorescence from single molecules by using microscopes. A single molecule, or a small group of them, appears as a bright blur in the image. This is where the Eiffel Tower metaphor comes in. We find that no matter what magnification we use, light from a very small source will always blur into a blob: when this happens, it is impossible to tell apart two molecules close to one another, in quite the same way it was impossible to tell who was who in the Eiffel Tower picture. This effect is called diffraction, and it is a problem if we want to see details about how each molecule works. To get around this problem, scientists can place a sharpened optical fiber — the same kind of fiber used in computer networking — close to a molecule to absorb light, the same way a doctor would use a stethoscope to listen to different parts of your chest. By moving this aperture around a sample, a map of fluorescence can be created. Nevertheless, as Ho points out, there is a problem: "in reality, it is almost impossible to make a light source or an aperture that is smaller in dimension than a small molecule. To date, with existing techniques, such as near-field optics or super-resolution imaging, the resolution is, at best, 10 nm." To make a parallel, this would be like a doctor trying to listen to your chest with a 10-meter wide stethoscope! As can be expected, no detail about the molecule can be seen with this method. In order to see inside a molecule, Ho and colleagues use electricity instead of light to acquire an image of the fluorescence. They make use of a technique called scanning tunneling microscopy, in which a sharp metal probe is brought close to the molecule and a voltage is applied. The probe acts like a cattle prod, exciting parts of the molecule with small bursts of electrons, and these electrons become a power source for the molecule. Shortly after the electrons are injected into the molecule, light is emitted through fluorescence. 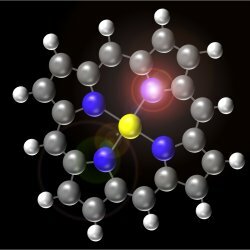 The brightness tells us how efficiently the molecule can accept electrons where the probe is. Moving the probe around, Ho’s group has created a map of the molecule. In terms of camera resolution, this would be like upgrading from your 5-megapixel phone to a 10-giga-pixel camera with state-of-the-art optics. The particular molecule they investigate is porphyrin, a convenient test subject since it is common in biology but can also be made synthetically. The images Ho’s group obtains show dark and bright spots on the molecule. If they place the metal probe at the bright spots, the molecule efficiently absorbs the electrons and emits light, something which does not happen when the probe is placed at the dark spots. This map shows us where the electrons within the molecule spend longer. For this reason, Ho’s group believes they have reached the "ultimate resolution." Their next step will be to figure out the time scales on which the molecular dynamics happen. How long does it take to excite the molecule? Does that time change depending on the location of the probe? How far can an electron move in that time? Ho’s group has achieved a level of expertise that is likely to remain unchallenged in the field for some time. Jay Gupta of Ohio State University (USA) points out that "this is a very demanding technique that can be performed by a few groups only." It has to be done in ultra-high vacuum, and requires exquisite control over the probe, sample, and other experimental conditions. Be that as it may, and while it may not become widespread in the near future, Gupta says that "the information provided by the measurements is quite fundamental, so the results should be broadly applicable." The behavior of a molecule – that is, how it interacts with light, electricity, and other molecules – is strictly governed by the way it uses energy. When an electron becomes excited, it takes on energy that can be used to break a bond, vibrate the molecule, or emit light, as in the case of fluorescence. Fluorescence images, therefore, give us information about how the molecule uses energy, which, in its turn, helps us make educated guesses about how it would interact with other molecules. Ho believes that the information gained from experiments like this "can help the design of new molecules in order to optimize a desired process, like, for example, the electron transfer in solar cells." Designing new molecules to do our bidding may sound like science fiction, but Jay Gupta says that similar projects are already underway. "This is already happening at some level. At this point, the process is still guided by chemical intuition rather than real quantitative design. I think this is the potential of techniques like the one demonstrated in Ho’s group." BD s currently working on his Doctoral Thesis at The Institute of Optics, University of Rochester, Rochester NY (USA). Chi Chen, Ping Chu, C. A. Bobisch, D. L. Mills & W. Ho, Viewing the Interior of a Single Molecule: Vibronically Resolved Photon Imaging at Submolecular Resolution, Physical Review Letters (2010) 105, 217402 (link).